1 Step 1: Head to “Settings” again! 1 Step 1: Make haste! Getting bored of the regular text-based chatting? Love to send little snapshots to get instant responses from your friends? You’re not alone. Snapchat has become one of the most widely-used apps on the market for this very reason. It is massively popular with young people who love the combination of expression and privacy that it brings. However, keeping track of all these conversations can become cumbersome. For this reason, it is essential to know how to delete saved Snapchat messages among other ways to manage your daily Snapchat activity. You might often want to delete a conversation you had with someone. This is very easy to do as I shall explain. However, do note that this does not delete the messages on your recipient’s device. On opening Snapchat, you will most likely find yourself on the main page which displays the camera. Swipe up once. This will open your main control panel which will have the big, yellow “ghost” icon in the middle and the three options which say “Added me”, “Add Friends” and so on. Look for the icon that looks like a gear and tap on it. This will get you to your settings page which contains options on how to delete saved Snapchat messages. Most of the times, when you want to delete or clear something, you’ll need to go through this page! Clicking on the gear icon will open up two options. The first will read “clear conversations” and the second would allow you to log out. Tap once on the first option. This will open access to a page where you can manage your conversations. As you tap the above-mentioned option, a page labelled “Clear” should pop up. This will contain the list of names of the friends you have exchanged messages with recently. Beside their names is an icon shaped like an “X”. Tap on the corresponding “X” to clear all messages with that person. Beware that this would only clear your record of the conversation. The other person will still have all the messages saved in his or her device. It is best to message that person to clear his or her message log as well, if you want total deletion. Often, you would want to just clear out your entire log. Thankfully, you do not have to do this one conversation at a time. Look for the “clear all” option on the top right-hand corner of the “Clear” screen. Tapping on this once would get rid of your entire conversation log. It is often a good idea to refresh your profile by clearing your story and replacing it entirely with a new one. And here is how you do it. Step 1: Head to “Settings” again! The first few steps are similar to what I have explained on how to delete saved Snapchat messages. Swipe upwards once from the main menu so that the usual three options and the big, yellow ghost appears. Tap on the third option that says “My Friends”. A list of all your contacts opens up with your name on the top. Tap on your own name to expand your story. On your own story, tap on snap you want to delete and click on the “X” to get rid of it. In this way, you can delete parts of your story or the whole of it. Ordinarily, there is no way to delete messages that have been seen already, so this requires being very quick! Unfortunately, once you have sent a snap to someone, you cannot take it back. All you could do is to delete your account altogether in the hope that no one has seen your snap yet. Here is how you do this. 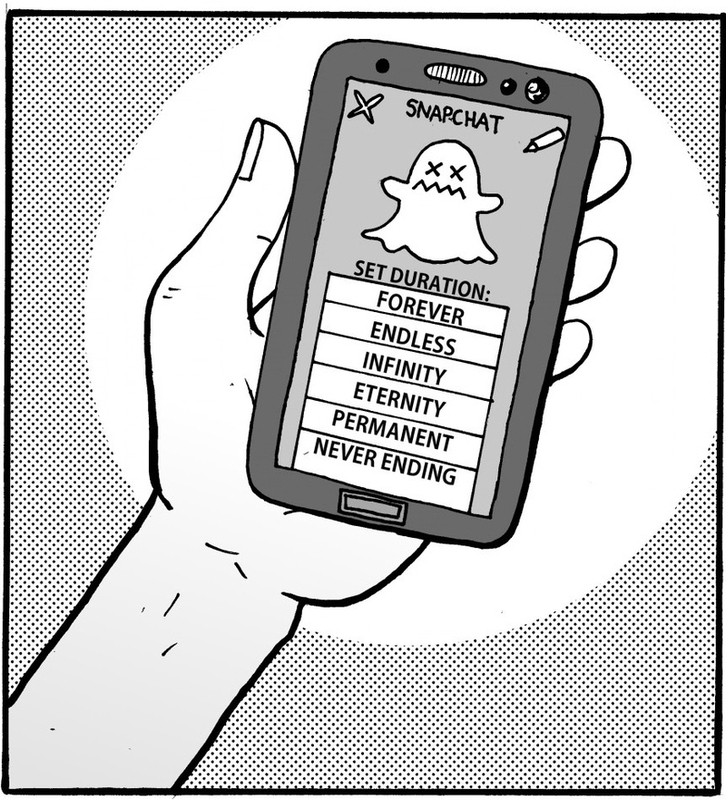 Since you cannot delete sent Snapchats once they have been seen, time is definitely of essence. It is a completely different approach than how to delete saved Snapchat messages. The only way to work around this is to quickly delete your Snapchat account to prevent the other person from seeing the Snapchat you sent them. So implement this method without wasting a minute, as soon as the snap has been sent. Helpfully, Snapchat makes it possible to view the status of the snap i.e. whether it has been seen or not. This can be done through a computer or your phone. I’d prefer you do it through your smartphone as that would minimize the delay. The URL is “support.snapchat.com”; log on to it and head to the page that would allow you to delete your account. This can be done by clicking the “Learning the basics” options and from there navigating to “account settings”. Now that you are on the “account settings” page, click on “delete an account”. Snapchat will ask for your username and password to confirm that it is really you. Check the box that verifies that you are not a robot and hit the “submit” button when you are ready. Sadly, deactivating your account is irreversible and the only way to stop people from seeing your sent Snapchats. It is inconvenient, granted, but it is the only way to prevent your snap being viewed. Once you have deleted your account, all the unseen snaps you have sent will become un-viewable and will essentially be deleted. Voila! I must mention that this step is very drastic and you should take it only when the snap you have sent is really something very sensitive. Otherwise, just apologise to the person you sent it to and ask them to ignore its existence. It is very disheartening to start from scratch again, but this is the harsh reality. Plug in a username and password and start your Snapchat journey once again. A small tip: you can use your Snapchat story to tell people that you are back on Snapchat under a different name so it shouldn’t be too hard. But hey! At least you successfully deleted that embarrassing snap right?